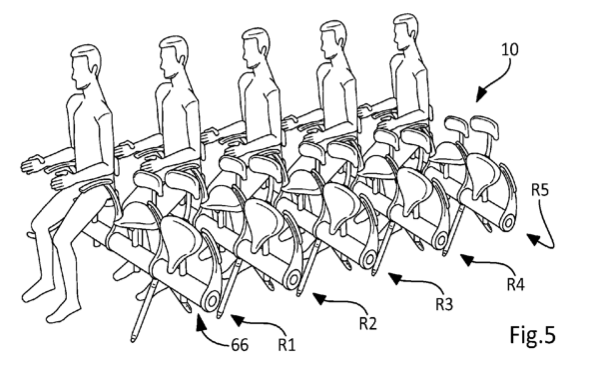 The race to squeeze the most passengers per plane is truly on. Alex reported a study last week that could increase capacity in a 737 by 21%. despite many enhancements made to aircraft seats, the retracted-up seating still has a certain thickness which remains cumbersome. More like a Greek galley. Isn't lashing patented already? Ok, ok, I get it. Sorry Airbus for being a bit harsh here. I know a patent is just that and that you probably don't mean ill. Instead of fancy words like "kinematics" and "deformable parallelogram" though, you should simply lobby the IATA to allow passengers to stand up—after all, I've witnessed it happening already in emerging countries.